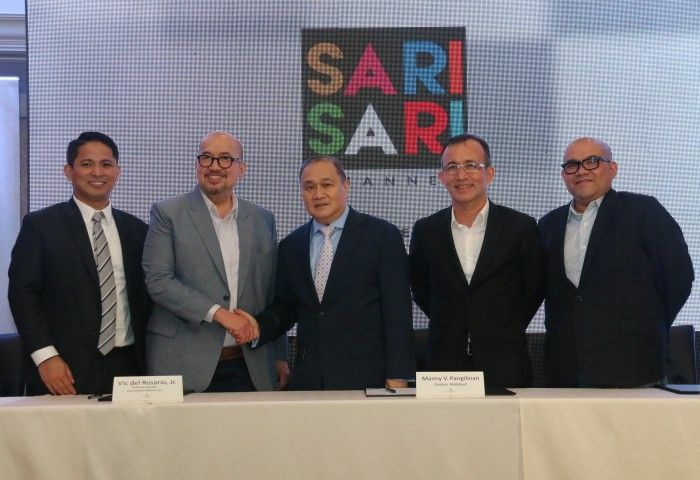 With the last quarter of 2015 just around the corner, a new star in the entertainment horizon rises with the launch of Sari-Sari Channel – a 24/7 entertainment channel designed to deliver today’s finest movies and tele-dramas to Filipino audiences both here and abroad. This joint venture between Cignal TV and Viva Communications, Inc. promises to offer a variety of programs that will cater to all types of audiences, be it drama, suspense or thriller with new shows like Tabi Po, Class 3-C Has a Secret, Barrio Kulimlim, The Feb 15 Club, Kuya and Me and Sa Ngalan ng Anak. The contract signing was led by the industry’s most respected bigwigs: MediaQuest Chairman, Mr. Manny V. Pangilinan (MVP); Cignal TV President and CEO, Mr. Emmanuel C. Lorenzana; Cignal TV COO, Mr. Oscar A. Reyes Jr.; Viva Communications, Inc. President and COO, Mr. Vincent del Rosario III; and Viva Communications, Inc. Chairman and CEO, Mr. Vic del Rosario Jr.
Viewers are expected to fall in love again with original movies produced by Studio5 including Alice Dixon’s The Lady Next Door, Superstar Nora Aunor’s When I Fall In Love (a reunion with perennial onscreen partner Tirso Cruz III), Jasmine Curtis-Smith and Daniel Matsunaga’s Replacement Bride, Angel Aquino and Derek Ramsay’s Bawat Sandali, Sarah Lahbati’s More Than Words and Jasmin Curtis-Smith and David Archuleta’s Nandito Ako, among others. Moreover, Filipino movie fans will have more reasons to watch Sari-Sari Channel’s classic collection of Viva Films’ box office hits such as Vice Ganda’s Petrang Kabayo, Judy Ann Santos and Sarah Geronimo’s Hating Kapatid, Anne Curtis’ Who’s That Girl?, among others. On top of these heart-warming Pinoy movies and series, Sari-Sari Channel commits to showcase other line-up of fresh and unique programs with a mixture of brave, brilliant, dramatic and extraordinary flavors that will suit every viewer’s taste.